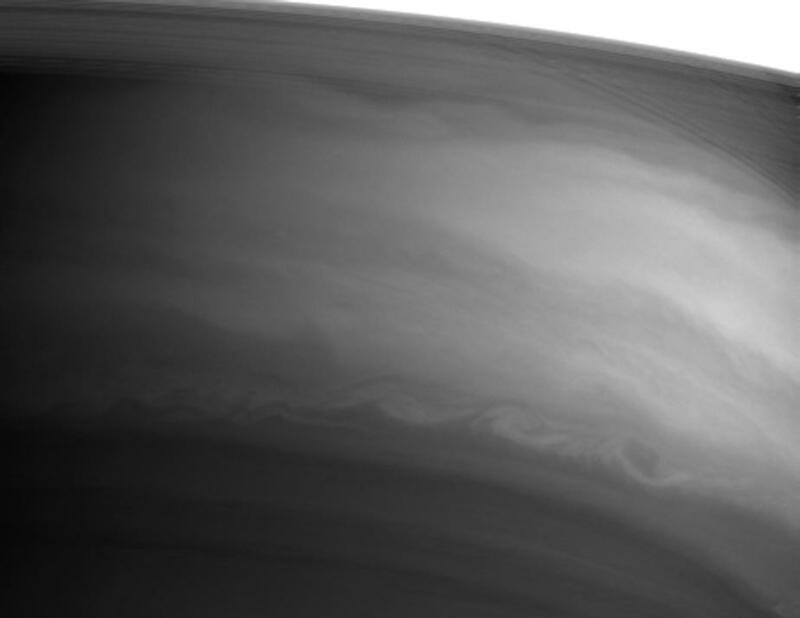 This 22-second exposure of Saturn's equator was taken on September 12, 2004. The white area in the upper right is actually the rings of Saturn but deliberately overexposed. Photo Coutesy NASA/JPL-Caltech. Jupiter and Venus share the dawn, rising nearly four hours before sunrise. They have a close pass (roughly half a degree apart) on November 4th. Check out the sight in a low-power eyepiece: brilliant Venus, magnitude -4 and showing a small gibbous disk, and bigger but fainter Jupiter, with all its bands and moons. This should be a very nice conjunction for the early riser with any level of observing equipment, from the naked eye to a large telescope. For the telescopic observer, Io's shadow begins a pass at about 5:30 am that morning. Meanwhile, Mars creeps up out of morning twilight, gaining height as the month progresses. It's fairly small, so it will be a struggle to see much detail when it's so low in the sky. The evening belongs to the outer planets. Uranus and Neptune are low in the western sky at sunset, setting before midnight; but meanwhile, by around 10 p.m., Saturn has risen. Pluto, alas, is too close to the sun to be seen this month, but observers who want a glimpse of something small can check out Mercury, very low in the evening twilight during the latter half of the month.